Velingrad will host the international tourist exhibition for spa, wellness and health tourism in 2018. The decision of the Municipal Council for its organization and conduct has been handed today to the Minister of Tourism Nikolina Angelkova by the Mayor of Velingrad Dr. Kostadin Koev in a meeting of the National Tourism Council taking place in the town. The forum also discussed the Annual Programme for National Advertising for 2017 and the work of the Interinstitutional Council for Personnel in Tourism. "This is the second year, in which we discuss the programme for national advertising about 6 months prior to the period of performance. This allows us to schedule more effectively our marketing activities”, said Minister Angelkova. She announced that the results are now a fact and for the first five months of the year 2016 the country was visited by over 1,9 mln. of foreign tourists, which is nearly 9% more than for the same period in 2015. The rise in the visits for holiday and vacation is 20%, and the income from international tourism for the period from January to April amounts to 453 mln. Euro, which marks an increase of 8%. "In 2017 Bulgaria will participate in 45 international exchange markets in some of the greatest tourism-generating markets – Germany, Russia, Spain, The UK, Austria etc. ", said Minister Angelkova. According to her the draft programme includes 13 new offers for participation in oversea exhibitions, but the Bulgarian attendance will depend on the activity of the sector. Among them are exchange markets in Lithuania, Latvia, Estonia, India, China etc. “We will further develop the initiatives that were started in 2016 - better online activity, direct forms of advertising, such as organizing journalist and expedient tours, partnerships with large tour operators etc.”, the minister said. 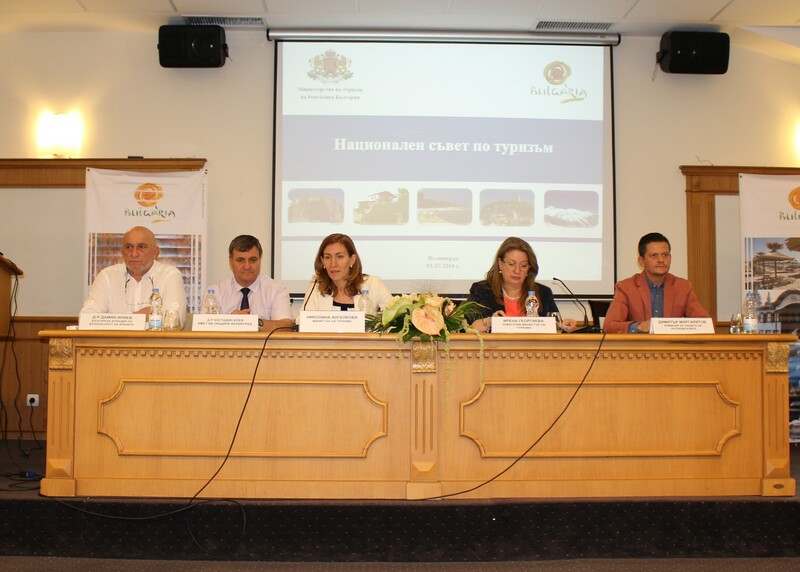 The meeting of the National Tourism Council was attended by the Deputy Minister of the Regional Development and Public Works Denitsa Nikolova, the Deputy Minister of Defense Desislava Yosifova, representatives of other ministries, the chairman of Velingrad Municipal Council, the Chairman of the Commission for Consumer Protection Dimitar Margaritov, the Executive Director of the Bulgarian Food Safety Agency Dr. Damyan Iliev, the National Revenue Agency, tourism associations, branch organizations, resorts and tourist complexes, consumer and business organizations, schools etc.